Just as you wanted to put a site on the web, there may be times when you want to remove a page from that site. Again, in Google Page Creator, it’s a simple process that can be accomplished in a couple of different ways. One way to unpublish your site is right from the Page Manager screen. All you need to do is place a check mark in the small box beside the thumbnail for the page that you want to unpublish. Then, click the More Actions drop-down menu shown in Figure 1. From the menu, select Unpublish. The Page Manager loads briefly, and then the colored block around the page you chose turns yellow, indicating that the page has not yet been publish. Another option for unpublishing a page is available on the Edit Page screen. Just open the web page that you want to unpublish and then click the Unpublish link at the bottom of the page, as shown in Figure 2. When you click the Unpublish link, you are prompted to confirm that you want to unpublish the page. Click Yes, and the page loads briefly; then a message like the one shown in Figure 3 appears, letting you know the page has been unpublished. When you return to the Page Manager screen, the colored block around the page thumbnail will have changed to indicate the page has been unpublished, too. One more thing you may want to know about unpublishing pages is how to delete them after you’ve unpublished them. After all, you won’t want those pages cluttering up your Page Manager forever, right? To delete a page, place a check mark in the small box next to the page, and then from the More Actions drop-down menu, select the Delete option. You’ll be prompted to confirm deletion. Click Yes to confirm, and then the Page Manager loads briefly and the pages disappear. CAUTION: Be cautious when deleting web pages. Once they’re deleted, you can’t get them back. This means that if you decide later that you want the pages back, you’ll have to recreate them completely. Unpublishing or deleting web pages are common activities when you’re designing or updating your web site. With Google Page Creator, you dont’ need to change everything just to unpublish or delete a page. Instead, it’s a simple point-and-click process that will have your unwanted pages removed within minutes. 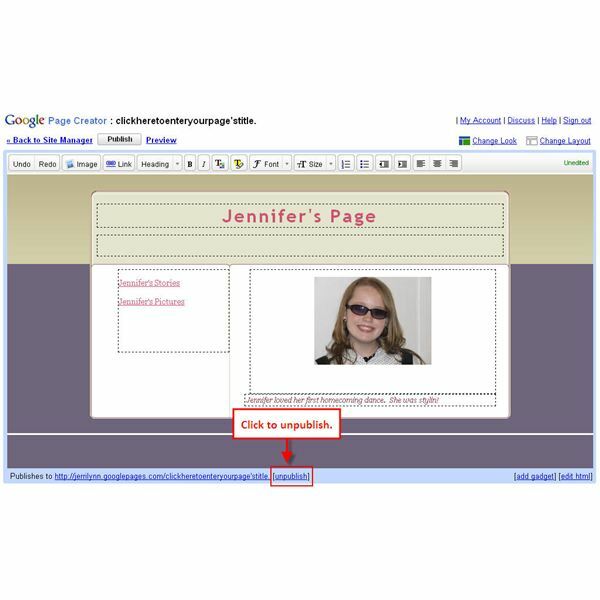 Google Page Creator is an easy to use, web-based web page creation and editing software. Pages created using Google Page Creator can then be published in the Google Pages Community. 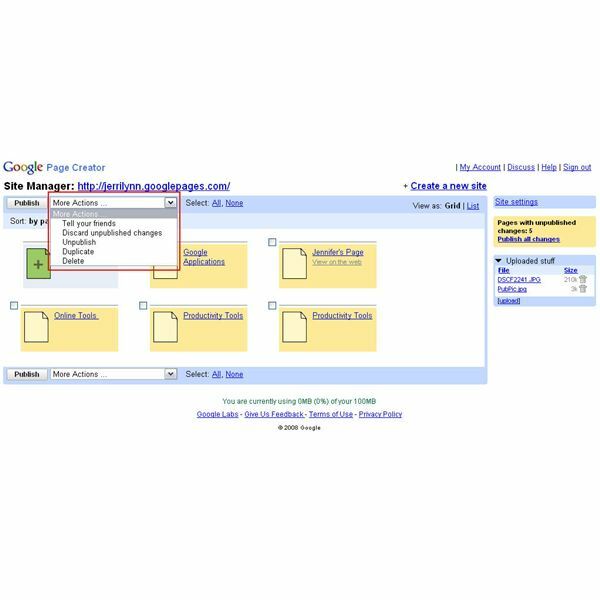 Learn how to use Google Page Creator to start building your own web pages in no time with this article series.